Um fato interessante é que a Turquia havia efetivamente se tornado uma república desde 23 de abril de 1920, quando a criação da Assembleia Nacional da Turquia foi introduzida. No entanto, apenas 3 anos mais tarde que ela foi oficialmente reconhecida. Nesse dia os prédios governamentais, escolas, correios e muitas empresa não trabalham e edifícios administrativos, bancos, as ruas das cidades, as lojas e muitas janelas de casas e apartamentos privados exibem a bandeira turca ou a imagem de Ataturk. Durante todo esse dia existem programas e apresentações para homenagear a Républica e Ataturk e muitas cidades fazem desfiles oficiais com bandeiras e bandas musicais, que normalmente acabam com fogos de artifícios. A tarde do dia anterior, 28 de Outubro, também faz parte do feriado oficial. Bancos e prédios governamentais funcionam apenas meio período nesse dia. Cumhurriyet bayramı kutlu olsun ! The Republic Day marks the establishment of the Turkish Republic in 1923. After the victory of Turkey’s War of Independence (1919-1923), the Turkish parliament proclaimed the new Turkish State as a Republic. On 29 October 1923 a new constitution was adopted replacing the Ottoman Empire constitution. The leader of the Turkish War of Independence, Mustafa Kemal Atatürk, became the country’s first president on the same day and for him, the Republic Day is the most important holiday in Turkey. An interesting fact is that Turkey effectively had become a republic since April 23, 1920, when the creation of the National Assembly of Turkey was introduced. However, only three years later that it was officially recognized. 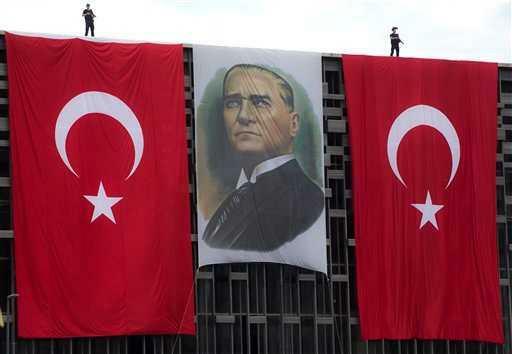 On this day government buildings, schools, post offices and many companies don’t work and administrative buildings, banks, city streets, shops and many houses and apartments windows display the Turkish flag or some picture of Ataturk. 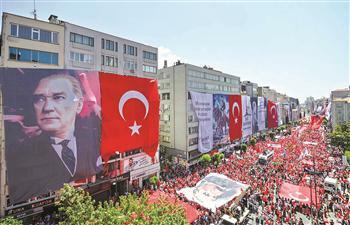 During that day there are presentations and programs to honor the Republic and Ataturk, many cities make official parades with flags and music bands, which usually ends with fireworks. The afternoon of the previous day, 28 October, is also part of the official holiday. Banks and government offices work only part-time on that day.